One fine summer day, Ms. Z and her mommy and daddy visited the Brooklyn Aquarium. Z was excited to see the many soft little snuggly mermaid cloth dolls for sale at the gift shop ... but sad that not ONE of them had brown skin or curly hair like her. She settled for a pale mermaid dolly with straight brown hair but asked her mommy -- where can I find one that looks more like me? And so little Z and her mommy set out on a quest. They searched far and wide across the land and internet, but nothing was quite right. 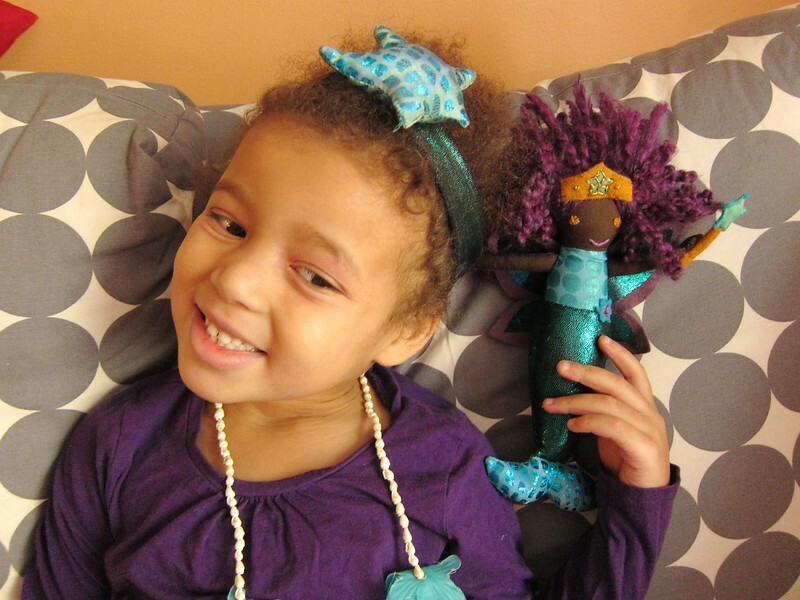 There was a brown-skinned mermaid Barbie, but she had straight hair and was made of plastic. 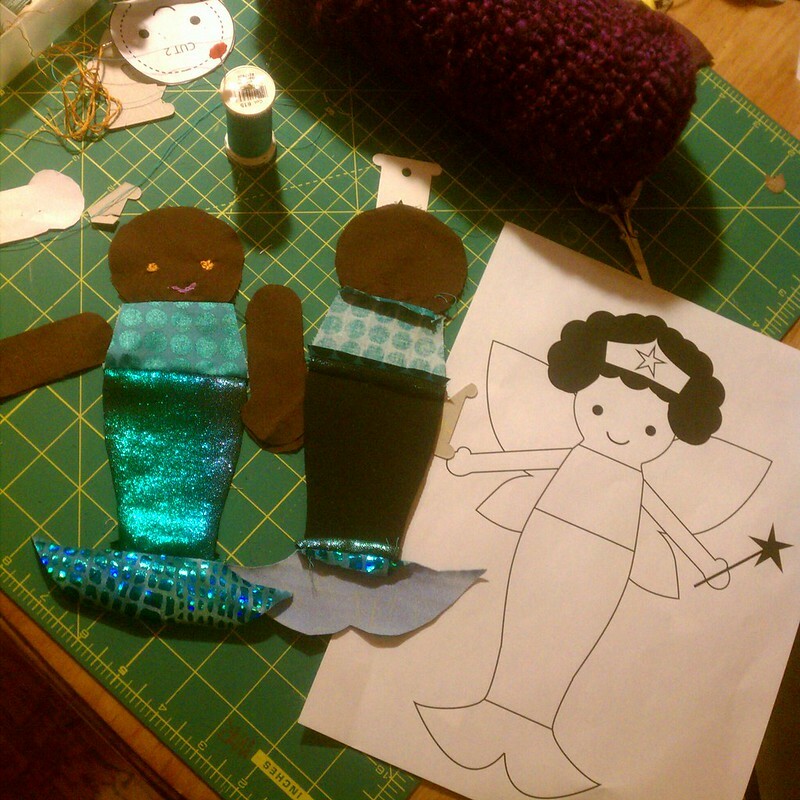 There were soft snuggly brown-skinned cloth dolls, but they had no magic powers or mermaid tails. 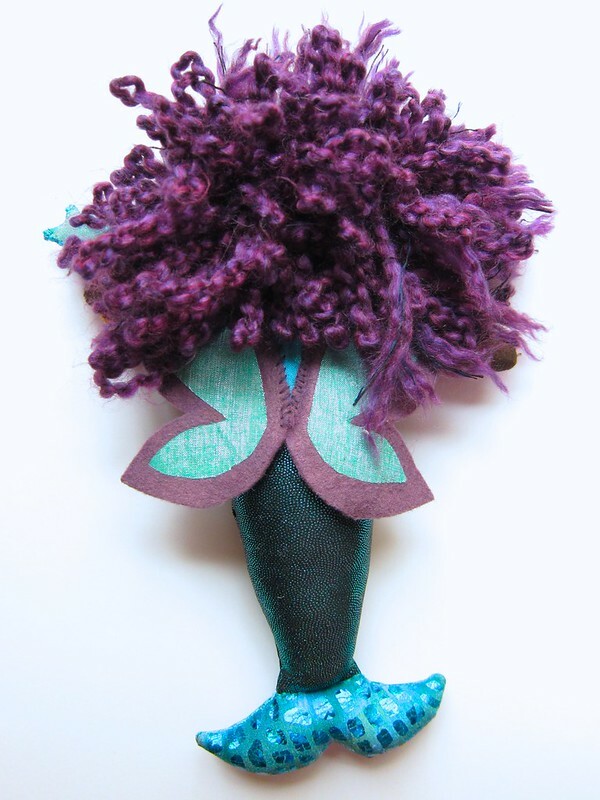 One day they journeyed to all four toy stores in their neighborhood: the first three had no black dolls at all; the fourth had beautiful handmade Waldorf cloth dolls with many skin colors and hair styles, but they were $100-$200 each and had no magical qualities. 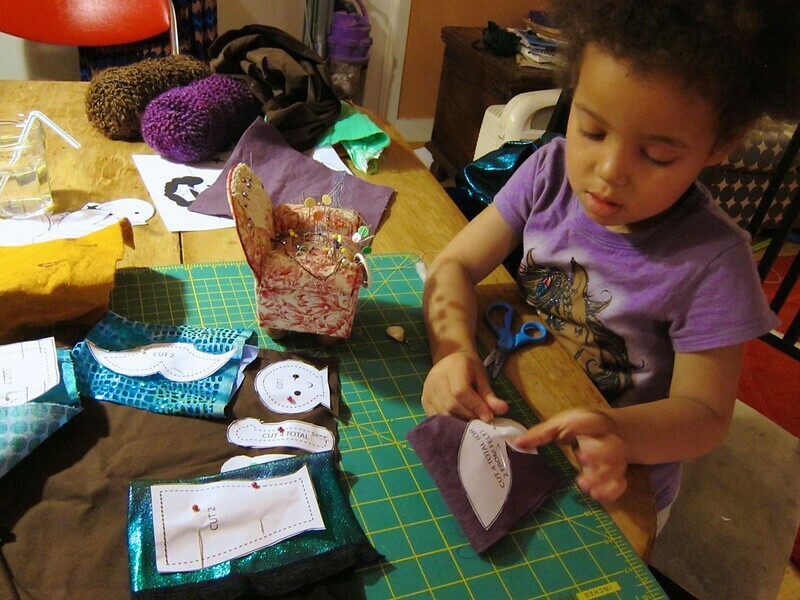 By now little Z and her mommy were feeling quite cranky, but luckily they had a magic power of their own: sewing. 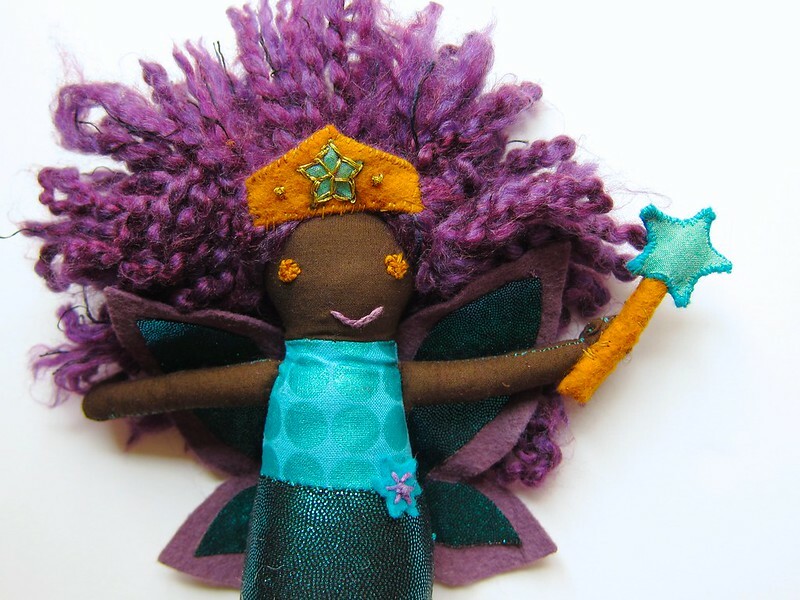 She was just what the little girl wanted: a mermaid fairy superhero with brown skin, curly (purple) dreadlocked hair, sparkly fairy wings, plus a crown and magic wand. And the little girl and her mommy were very, very happy. THE END. Holy cow, that dolly is awesome. Very talented kid and mom! Thanks! 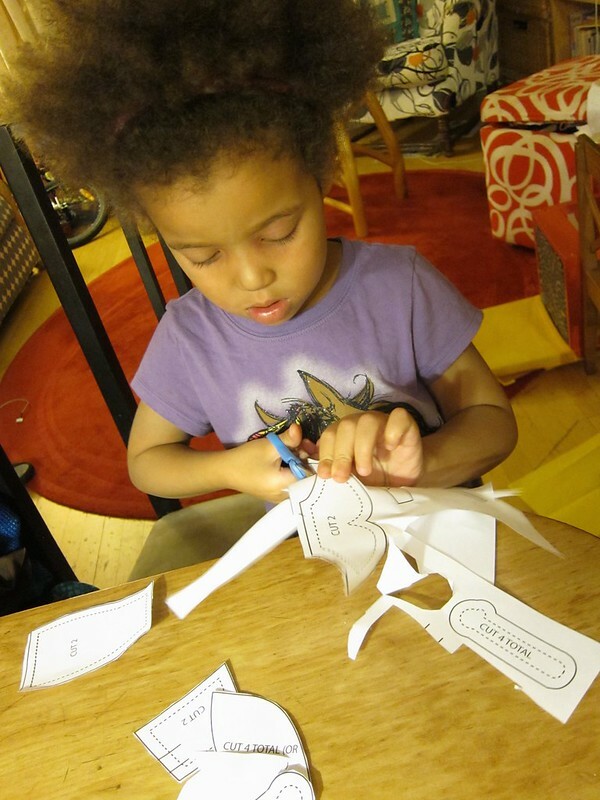 Little Z tells me "I am a maker, Mommy... I like to make cool stuff." That's the sweetest, cutest, most wonderful thing! Her smile says it all! Yes, her smile is definitely the best part! What a great doll and a great story! I find now that I can sew/make things that I am quite frustrated when I can't find things in the store that reflect my needs. Good thing you have super powers! I know! I resisted making the doll at first, reasoning I was too tired and too pregnant, but am glad I changed my mind and went for it. Amazing!! This makes me so happy! She is super duper cool! Amazing job Mommy and Z! I love this so much for so many different reasons! I really miss sewing things for lil kids. Thanks for sharing this Mikhaela! 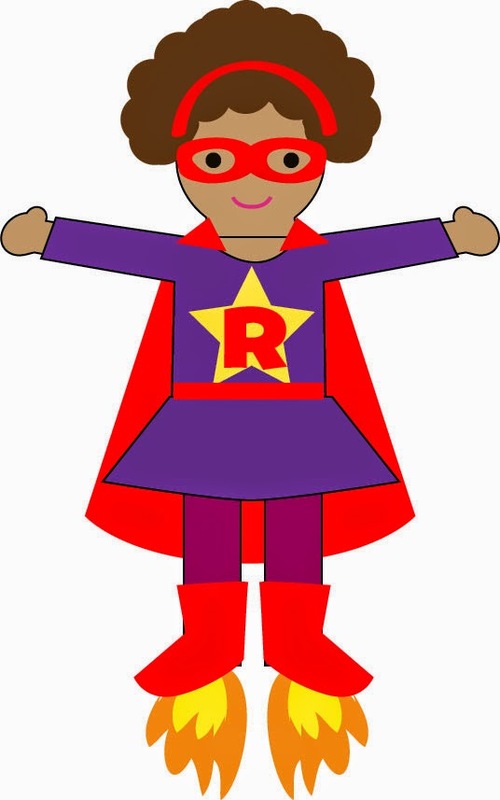 You are a super hero! 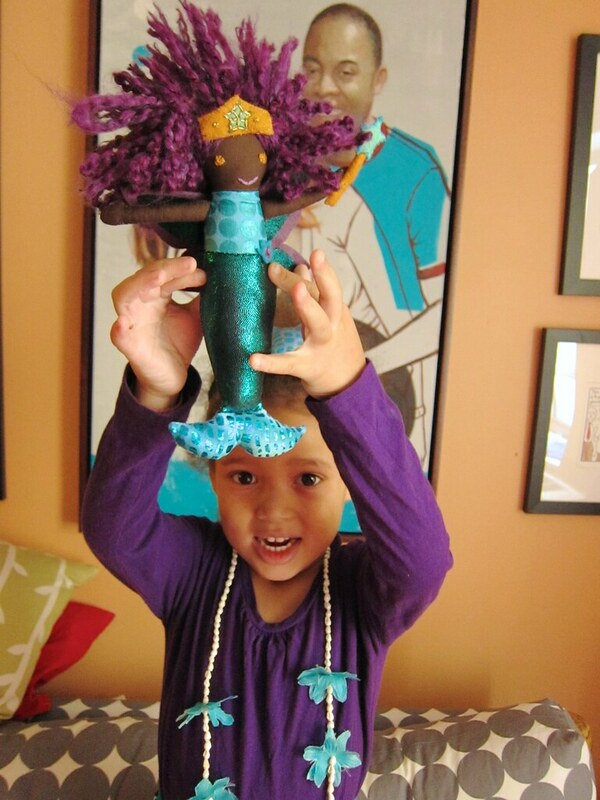 Z looks so happy and proud to have realised her dream mermaid! Beyond awesome. Great story and I love the doll! 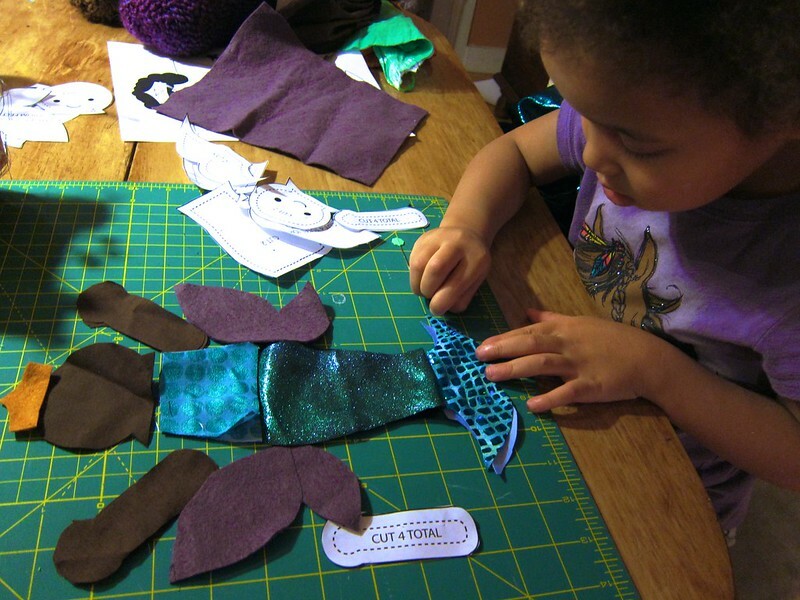 You must have really glad that you sew, so that you were able to help your daughter to get her dreamed doll ! She looks really happy with her doll ! I'm glad that you couldn't purchase a doll, this is so much cooler! It's so awesome that Z got to participate in the creation of this. Both of you should be proud! I know, I'm sort of secretly glad we couldn't buy one either... 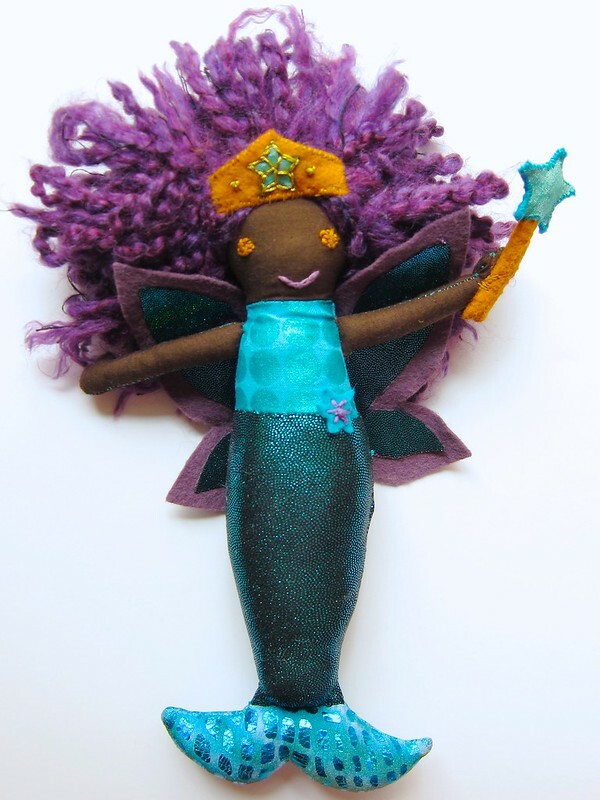 I mean, we could have gotten a black mermaid on Etsy, but she wouldn't have been a superhero or a fairy and Z would not have been so proud of herself either! This actually WAS so much better - Mikaela learned that sometimes (most of the time, frankly), you can't find what you want because...that's the way it is, but you can make your own..just..the..way..you..want. Lifetime lesson, there. This is so cute! Not only will Z treasure this doll, but I'm sure she'll always treasure the memory of you making it for her. That is so special! wow, i want this doll! she just reeks of awesomesauce! although it is frustrating that the store-bought doll situation was so fraught, this will always be special and treasured and you can keep making more as Z's imagination continues to soar. awesome work, mom! Oh, this is wonderful!! 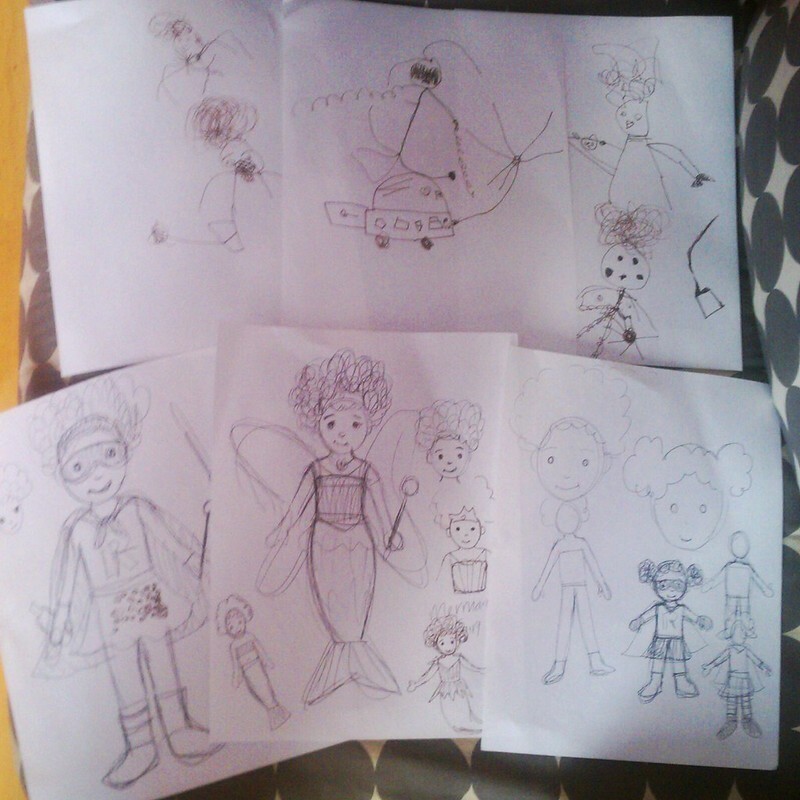 My little girl is also fascinated with mermaids, girl super heros, and fairies. She has hair just like Z's, only it is blond. But, I am certain that she would prefer it to be purple! Oh how exciting! I would love to see it! 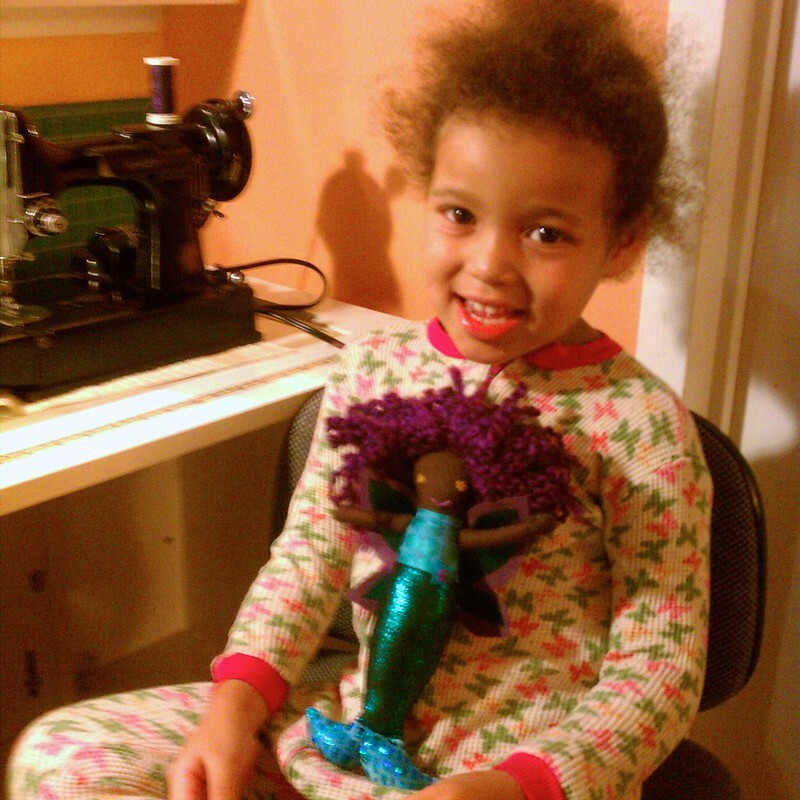 Mikhaela, I'm really glad you know how to sew and could make this awesome doll for Z. It's so sad to me that companies completely ignore a fairly sizable chunk of the population like that. 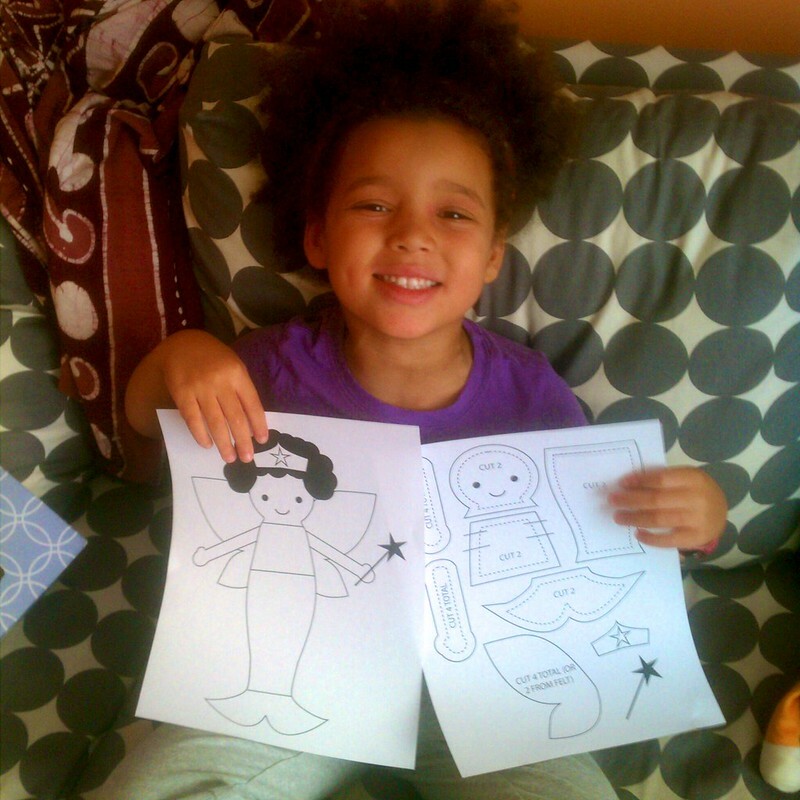 EVERY little girl deserves to feel good about herself. At least you guys got to make it together, and now Z can feel empowered instead of ignored. Yeah, seriously. Related fact: "Of 3,200 children’s books published last year, only 93 featured black characters." She is FREAKING FANTASTIC. I just absolutely love her, and her origin story! 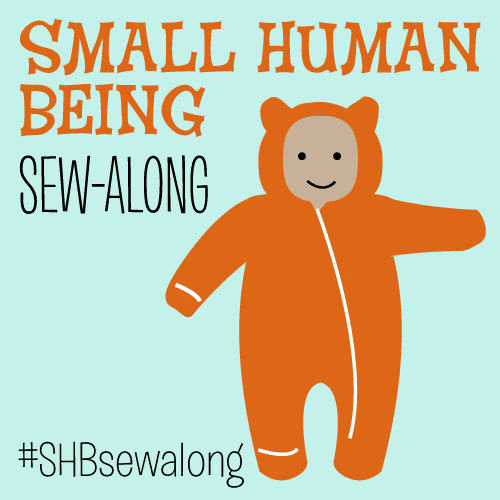 The selection of storebought dolls is a bit depressing, but luckily, you guys have the superpower of sewing! Yay! This is so amazingly special. 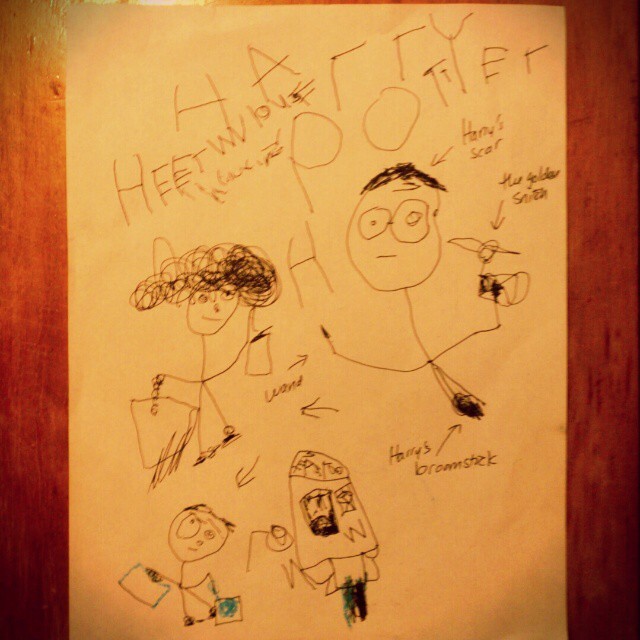 Also, Z's drawing and writing is like, crazy advanced! Whoa! My five year old is still scribbling, lol. She's truly a superstar. I love that this read just like a pictorial comic book. I'm sharing this link for sure! This is so awesome! What a great thing to do together, and she will treasure that doll. I heart everything about this story. You, and Z, are awesome. The hair is the best part, I think. And Z's drawings are fantastic! She's absolutely magical! The purple dreadlocks are an excellent touch. What a fun project for the two of you to work on together too! Props to a fantastic creative duo! !